Ever see those recipes for Potato Skins that tell you to ‘reserve’ those scooped out mashed potatoes for another day? 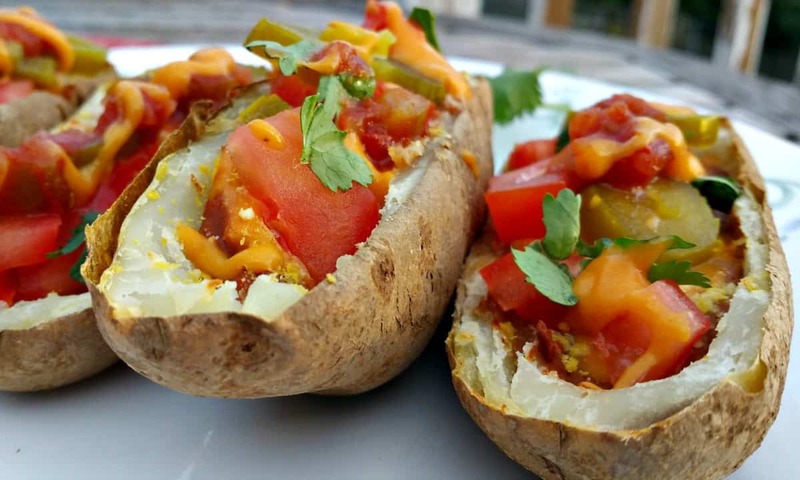 In these Loaded Mexican Potato Skins we’re going to USE those precious carbs and make one of the creamiest ‘CHEESE’ sauces ever. Nothing wasted! We’re even going to throw in a Sweet Potato for added nutrition (and that lovely cheesy color). 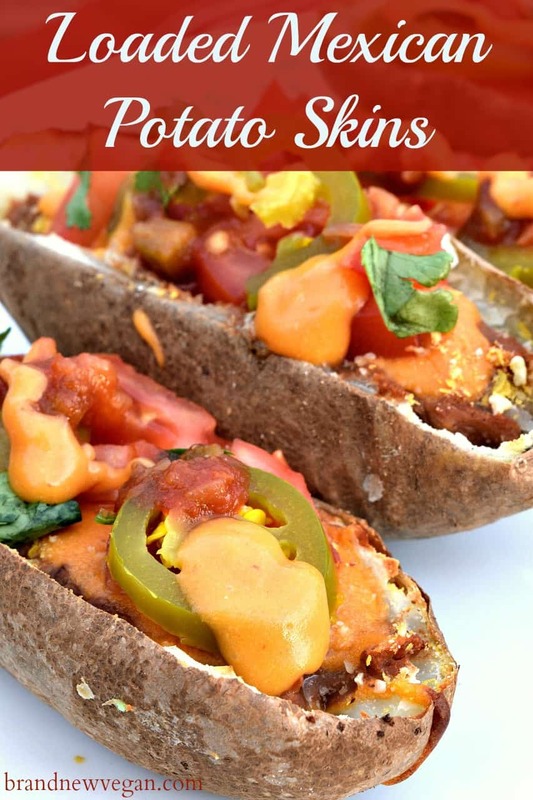 Wait – Potato Skins with Potato Cheese? And a Sweet Potato too? Can you even do that? You better believe it – and it tastes AMAZING! A Potato Lover’s dream – just for you. The Potato part of this recipe is super easy. Scrub up 4 or more large Russet Potatoes, poke them with a fork, and toss them in the oven. Don’t use foil, or oil, or anything else – just place them on the rack and forget about them. We want those skins to be super crispy – which is the best part of a Potato Skin in my opinion! I also tossed in a small Sweet Potato too – just for that cheesey color. I know the Potato/Carrot Cheese Sauce is really popular – but what a pain to boil up ONE carrot when I can just bake another potato instead. Added nutrition and super convenient! So wrap this guy up in foil as we don’t really care about a crispy skin. The foil will help steam the sweet potato, making sure it’s nice and creamy when it’s done. Bake your potatoes in a 400° oven for at least 45 – 50 minutes – or until done. 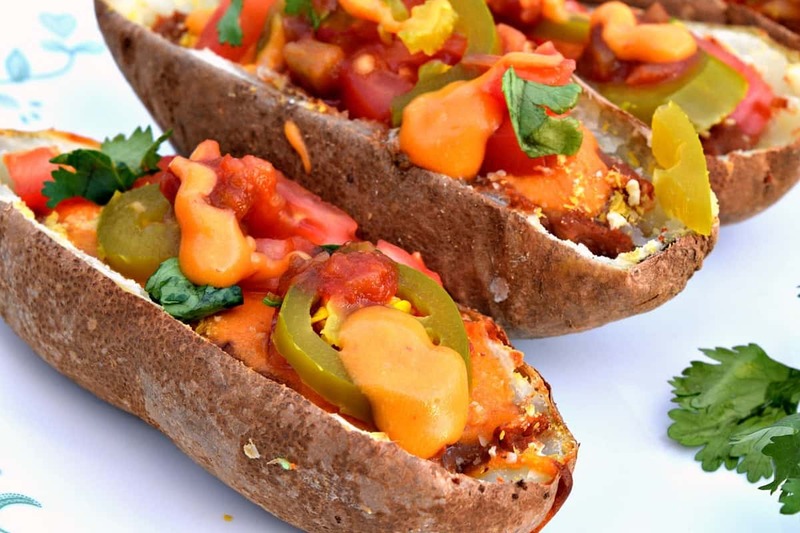 The nice thing about Potato Skins is that you can stuff them with whatever you want. I used Refried Beans (for ease and convenience) and added a tablespoon of Salsa and a teaspoon of that Mexican Taco Seasoning Mix we made last week in our Spicy Green Chile Bean Dip for additional flavor. With beans and cheese for our Potato Skin filling – you can garnish with whatever you have on hand. Once your Russet Potatoes are done – carefully remove them from the oven and cut them in half lengthwise. These are smoking hot – be careful! 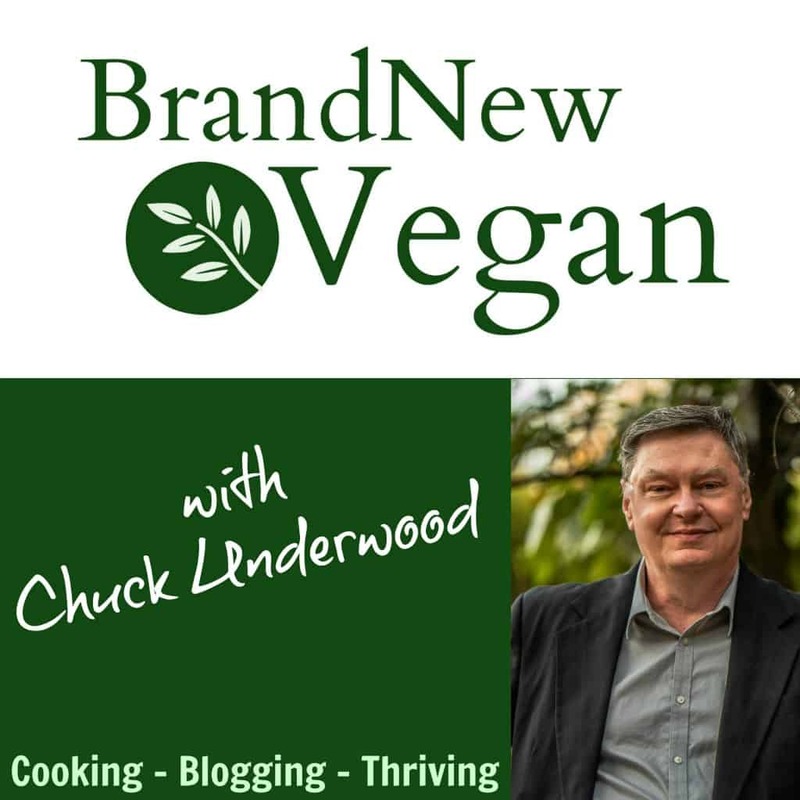 Now we want to scoop out that inner potato “meat” to make little boats or bowls so we can fill them with our beans and cheese. I used a knife to help ‘cut’ the inner flesh loose while using a spoon to scoop it out, leaving a ¼” or so of potato near the skin so they don’t fall apart. Add your scooped out potatoes AND your skinned Sweet Potato to your blender. Now add up to ½ cup of unsweetened almond milk and slowly start to blend. It will be thick initially and totally depends on how large your potatoes were and how much ‘meat’ you scooped out. So judge accordingly. Once the color is uniform and has the consistency of a thick, gooey cheese sauce – add in the rest of the ‘cheese’ ingredients – the lemon juice, vinegar, mustard, nutritional yeast, and spices and blend until well mixed. To give this ‘cheese’ that added Mexican kick – add in 1 Chipotle Pepper in Adobo Sauce. Blend until smooth and adjust spices to taste. Your potatoes skins should be cool enough to handle now – so simply scoop some of the bean mixture into each potato skin and top with some of the cheese. Place on a cookie sheet and bake an additional 10 minutes or so to crisp up the skins and melt the ‘cheese’. Now load on all those yummy toppings and serve. These skins would be awesome at a party or potluck – or served as a snack during move night or the big game. 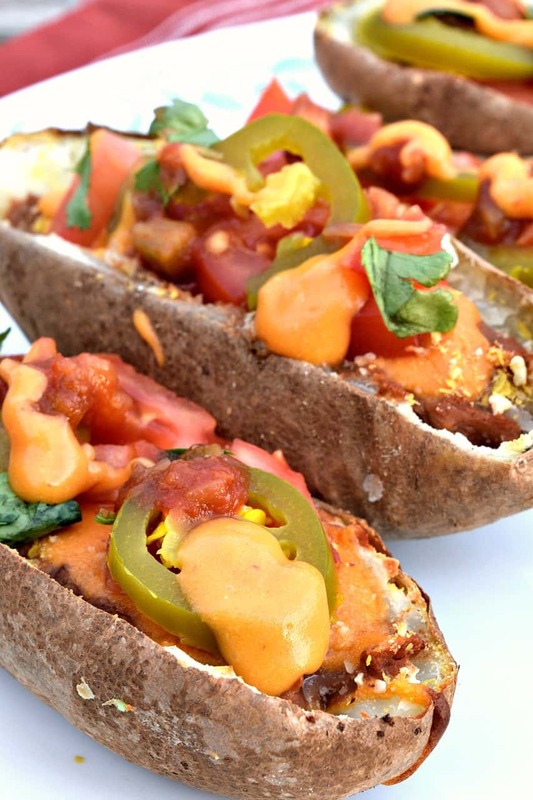 These tasty and nutritious Potato Skins are made almost entirely from potatoes! Even the Cheese! Topped with Beans, Cheese, and your favorite Tex-Mex Garnish - these skins will be sure to please. Poke holes in potatoes and place on oven rack. 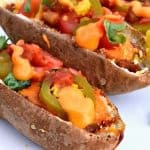 Wrap a small sweet potato in foil and also place on rack. Bake at 400F for 45-50 min or until done. Garnish with Salsa, Vegan Sour Cream, Avocado, Jalapeños, Tomatoes, and/or Green Onions. Were do you find chipotle peppers in adobo sauce? All the ones I have seen have some oil in them? Any substitutes available? They’re usually in the Mexican food section, in a small can. Most stores have them. Thanks for the delicious and nutritious recipe. We really enjoyed it!